Good for what ails you? Those that bought a 3DS at launch, and subsequently got stung by a drastic price cut, received 10 NES and 10 Game Boy Advance games as compensation. The NES games, and others from the system's library, have been gradually arriving in the eShop so that non-Ambassadors can join in, but Nintendo has consistently reiterated that it has "no plans" to do the same with GBA titles. If a new listing on Nintendo's Australian website is any indication, that policy may be set to change. As spotted by fancensus.com, an official page exists for Dr. Mario on Game Boy Advance. It's interesting that this was released as part of the Classic NES Series on the handheld, and an enhanced remake was also released as part of a 2-in-1 title, Dr. Mario & Puzzle League. There's a possibility that this listing meant to show NES as the platform, so there should still be a degree of caution about this one. Nevertheless, if this is a potential starting point for Game Boy Advance releases on the 3DS Virtual Console, which titles do you want to see the most? I saw this earlier. I need to warn you right now, after further digging, I found out that that GBA page has been on the Australian Nintendo website ever since the GBA ambassador games came out. It also says that Dr Mario GBA is "out now" for Australia. Which it isn't. This is clearly a mistake. There would be an announcement by Nintendo if they decided to start releasing Game Boy Advance games to the public. I'll be interested when they announce that they are going to give us Fire Emblem 7. @Linkstrikesback Thanks for that, and we've been careful to put a cautionary note in the article. We'll see if we can get official clarification from Nintendo. 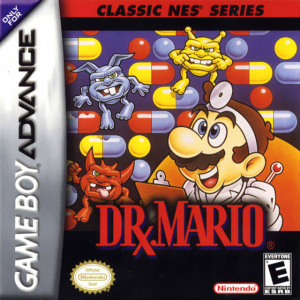 I would love for the GBA games to come out, though I'm expecting the actual NES/Famicom version of Dr. Mario to come out for the 3DS before any GBA game version. Linkstrikesback is right the GBA advance info has been there for a long time and if you look closely while we currently have Dr Mario on game boy you can't find it anywhere on the Australian site. I think this is just a case of them not providing the people in charge of the website with the correct info. I noticed that the information for the game says 1-2 players; none of the current GBA games support multiplayer (only Ice Climber NES supports it). @Angelic_Lapras_King: not necessarily, they may want those games to remain exclusive to ambassadors for a while longer. I think the GBA emulator for the ambassador games needs a bit of work before being saleable (for instance, sleep mode support needs to be worked in, icons need to be improved, save/restore points, etc). If they released the ambassador games, they'd earn no money for that game from anyone who's an ambassador. Releasing a new game wouldn't be much more work but would be a bigger earner. Of course it wouldn't have been there for so long if they had a contact form. Who's gonna write a letter or phone nintendo just to tell them they got the info on their site wrong? Not me. I love my ten GBA Ambassador games, but I would also love to see them improved by updates like the NES Games. I hope they release some Megaman Battle Network when they begin the GBA VC thing. That would probably be an insta-buy for me. But this is clearly the NES version. Why would Nintendo start emulating exact ports for the GBA that were from the NES? They need to get on with it already! By the time they decide to release them it will be another year or two down the road and the life span of the system will slowly whither away. Forget the gameboy and give us better quality!! Any Castlevania, Pokemon (especially Mystery Dungeon) or Final Fantasy game. forget gba, i want virtual boy on vc! I should mention that next week we in Japan are getting the final NES/Famicom Ambassador game out for public sale. If there was a time to announce the GBA games being sold publicly, it would becoming up anytime now. That was a typo, and GBA games would come to Japan first. This entry has been in the Australian Nintendo website for several months now. It's certainly an error on their part. Them viruses on the Box art for the game are so scary. Glad I still have my GBA SP. Nintendo can take however long they want releasing GBA games on the 3DS. When it happens it happens. "Classic NES Series: Dr. Mario"!? You've got to be effing kidding me! I wish they'd start putting GBA games on the VC. I'd love to pick up some of the gems I missed like Zero Mission and Fire Emblem, and replay old favorites like Advance Wars and Pokemon. Come to think of it, where's any Pokemon game?! @TrueWiiMaster: I think the problem that is holding Pokemon back from a 3DS VC release is the fact that in order to obtain all pokemon you have to trade with another player. Since there is no way to link classic Gameboy games on the 3DS VC you wont be able to get all the pokemon. I want Wario Ware which in turn has Dr. Mario as an unlockable game (it is called Dr. Wario). I lost this game a while back and actually miss playing it. I know this was an ambassador game I hope it comes to the public though. I would also like to play Yoshi's island never got to play that even on the SNES. I hope they update the actual GBA games because they are simple roms without a lot of options like the sleep mode and others. @Tasuki If they want they can just modify the game a bit to make it possible to catch all pokemons (just as some mod versions). It will not harm the trading system because they can disable the trade between VC version and all other versions (or all other 4th and 5th generations). What I really want is that they can improve the VC system for GBA, just like what they did for NES. However, it may be technically impossible. Hmmm... An error on their part. Well, we humans are just humans. We make mistakes. But I would like the GBA Ambassador titles to be improved emulation-wise. I mean, if they could pull it off with GameBoy, GameBoy Color, and NES titles, then they shouldn't have a problem with GBA titles. Especially when you put Metroid Fusion or Yoshi's Island into sleep mode, close the system, and then re-open it to have the game come out of sleep mode. They need first to fix the actual GB games and put all the Super GB options in them. I soooo hope that it is true! Because that means that the GBA games are finally entering the fray! About time!! onimusha tactics, golden sun, final fantasy up to 6 plus tactics, metroid fusion and zero mission, mega man, pinball of the dead, wario land 4, Kirby and the amazing mirror i think gameboy advance games coming out late was planned though i have been waiting for this since i got my 3ds which i love very much. i think this is what the eshop has been missing the sooner this happens the sooner i will be spending my hard earned cash on the eshop till then i will just keep buying ds/3ds games from stores. Looks like they've removed the GBA Dr. Mario info now although I still can't find anything on the Game boy game. As a member of the "exclusive" Ambassador club, I don't care at all if Nintendo releases those GBA games to other people. After all, I still got mine for free, and I hardly think keeping them out of the hands of other 3DS owners provides any extra benefit to me, other than maybe some bragging rights I'd as soon do without. What I really want to see them do is start releasing GBA games the Ambassadors weren't given though, such as Metroid: Zero Mission or the Advance Wars series. C'mon, there are some great GBA games that many would love to see come to the eShop, Nintendo. Let's get on it. This is a message. You are reading it.